Tonight’s episode of The Good Wife is understandably a little shaggy. After a few episodes that have been building up and then playing out a narrative crescendo, “The Material World” plinks and plonks a hasty movement before the planned resolution. It’s an hour with strong moments, but it’s not a strong episode. And, unfortunately, a lot of those strong moments were telegraphed in The Good Wife’s promos, including the one that immediately followed “Dramatics, Your Honor.” One is Diane Lockhart shoving David Lee’s preening David Lee-ness back into his face. The other is Alicia Florrick finally admitting to herself and Peter what she could never admit to Will—that she was in love with Will, and that it did matter, and it made everything different. It’s not exactly a spoiler when the studio just shows you what’s going to happen—and CBS seems anxious to keep viewers around now that its handsome male lead has bitten the dust. But it did mean the punches of “The Material World” felt a little pulled, even though it, like all episodes of The Good Wife, is nuanced and fantastic. What I like about The Good Wife, especially in this fifth season, is that the arc of each episode is rarely predictable. In that way, it’s markedly different from a lot of legal procedurals—notably, Law And Order, which is so predictable you could set your watch by it. (Minute 11: The wrong suspect is questioned. Minute 34: The detectives return to question the suspiciously famous guest-star. Minute 41: Justice is served.) Instead, especially as it’s matured, The Good Wife flouts expectation. So if I hadn’t been looking for those moments in the promo, I’m not sure I would have seen them coming. It works well here, as the show is trying to capture the abrupt, unexpected grieving process—the storyline, like Alicia’s behavior, is erratic. I feel like I’ve run out of ways to describe Julianna Margulies’ performance as Alicia—I’ve used “scintillating” and “transformative” already, haven’t I?—but “The Material World” is another brilliant showcase of it. The directors of The Good Wife (tonight, it was Griffin Dunne) have gotten into the habit of relying on Alicia’s face to tell part of the story—because Margulies can always sell it. The episode starts with Diane and Alicia getting sloppy drunk on martinis after the funeral, and one of the many things that Alicia says, apparently as a throwaway line, is that her mother wants her to “loosen up and get laid.” Naturally, I agree with her mother’s advice. But the line is clue to the rest of the hour. Alicia is always holding everything in—tamping down any inconvenient feelings and maintaining an icy façade. 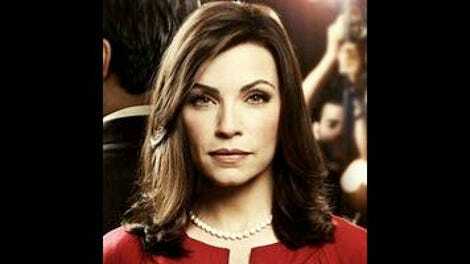 The Good Wife, the show, is about life breaking down Alicia Florrick. First, Peter’s scandals. Then the shame of not finding work, and the shame of staying with Peter. Struggling for money. Struggling in their marriage. It’s funny—as we saw in “A Few Words,” Will saved Alicia in her hour of need. But he also made it possible for her façade to exist for a few years more. Alicia used her newfound power to keep up appearances. She remained married, remained cooperative, and remained a political force for Peter. And she did that for the sake of making things look as neat as possible. Alicia doesn’t like messes. Will’s death, when she finally loosens up enough to mourn him, sends her to bed. (A sadder interpretation of “get laid.”) She goes under the covers from the bottom, without bothering to take off her suit or tie back her hair. The shot tracks her from the point of view of the top of the bed—we see Alicia go under, literally. It’s heartbreaking that the event that has finally shaken up Alicia isn’t something good but something terrible; heartbreaking, but kind of inevitable. You don’t know what you’ve got till it’s gone. I’m really happy that Alicia has finally kicked Peter out the door—it helped that Peter was being an even smarmier version of himself than usual, trying to make Alicia feel that all she deserved was a life with him. Of course, she’s still keeping up some basic appearances, but she seems to have accepted they’re just that—appearances. This episode bounces Alicia through someone she has helped (the YouTube dancer), someone she wants to help (Finn Polmar), a current case (a divorce suit that she crushes), a breakup, that awkward moment when your kids start taking care of you, and a potential merger with her former boss. It’s like a full cycle of life for Alicia, in just 42 minutes. It would make anyone take to their bed. FINALLY YES THANK GOD. Good riddance, Alicia/Peter. I didn’t really know how to tackle the neverending enigma that is Kalinda Sharma tonight. She’s broken and messed up, I get it. But tonight her story is more distracting than rewarding. I’m glad that Lana finally ended that (presumably that’s what slapping across the face means) because Kalinda just kept using her; but I’m not wholly convinced of what Will meant to Kalinda, or why Kalinda’s channeling her grief into work, or why she does anything she does, really. Also, Kalinda wears a halter-top bra. I just find this interesting. Also also, Kalinda sees stock footage of red blood cells floating in plasma when she thinks about Will dying, which didn’t really do it for me, either. Am I crazy, or… is Finn Polmar going to be Alicia Florrick’s next love interest? Next week: Louis Canning returns!